I am pleased to announce that I will be part of a group of artists exhibiting at Salisbury University Gallery, the details can be found on their site. We visited there yesterday and it is a beautiful space. 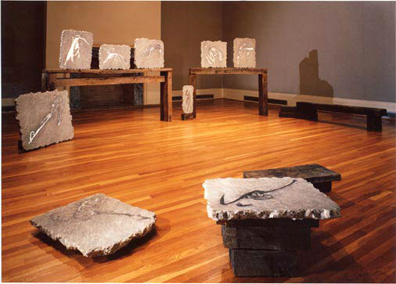 Above, an installation photo from James Fuhrman's exhibition at the Berman Museum of Art in 1992. Other artists in the show are, David Foss, Michelle Marcuse, Antonio Puri, and myself, Vincent Romaniello. The exhibit is curated by Alexandra Nemerov. You may recognize that this is the same group of artists that had a previous traveling exhibition entitled "Inner Circles".